A combination of chips and caramel reinvented! 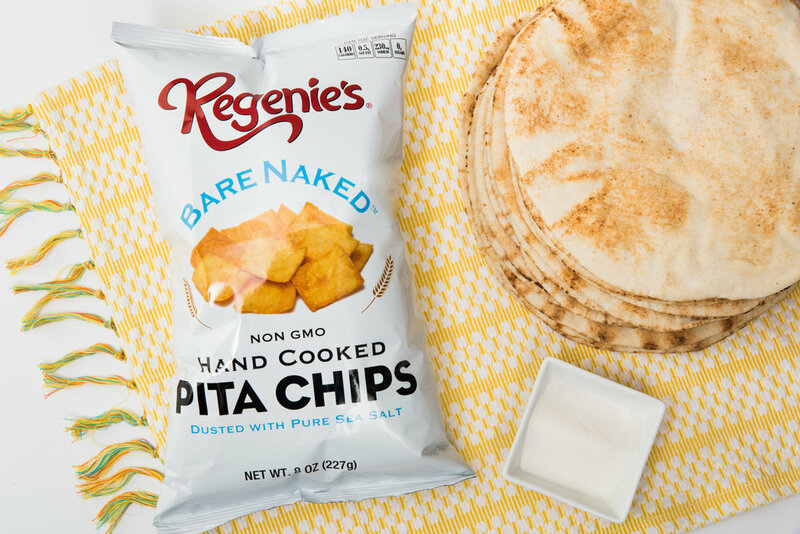 Join the flavor craze with our Regenie's pita chips. Our recipes include pure and simple recognizable ingredients that you can trust. Our flavorful and crunchy pita chips can be eaten straight from the bag anytime and anywhere. Try using them in your favorite recipe to add different textures and flavor or serve as a compliment to your favorite dips and spreads. A new twist on crackers our Mediterranean style Falafel Thins are made using wholesome fava beans, chickpeas, corn and a hearty blend of health conscious spices. Our Falafel Thins are great alone as a wholesome snack, crumbled on soup, salad or served with your favorite cheese. Robust flavor and unique texture with our distinctive Regenie's crunch are sure to be a crowd pleaser for any occasion. Craving an experience? Regenie’s brings you the region's most favorite snack in a convenient bag of chips, that you can enjoy anytime and anywhere. Our Falafel Chips are made with wholesome fava beans, chick peas, corn, and a blend of heart healthy conscious spices; red pepper, cumin, cloves, coriander and garlic - just like the real falafel balls. They're satisfying, too; with lots of protein, fiber, and great crunch. Try Regenie's Falafel Chips straight out of the bag or dip them in tehina or hummus, for the ultimate Middle Eastern gastronomic experience.